Well, just a quick minute to share what I've prepared for Monday evening's class! I'm so excited ... I just can't hide it ... I'm about to lose control and I think ... better stop there, huh??!! What do you think?! 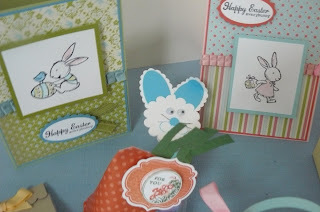 2 full-size cards using the Everybunny stamp set, plus 5 (did I say 5??!!) 3D items!!! I know the photo isn't the best, but I'll tell you briefly about them. I have two more photos to share that will show of certain of these projects a bit more. On the far right is Darla Duck. Isn't she so special?! I found the idea on Stampin' Connection and had to case her. The little Concord Crush hairbow on her "up-thing" just gives her ATTITUDE!! I used the Fancy Favor die for the bag and the Tasteful Trim die for the handle -- with a lot of scrimping and saving, I was able to make the whole bag and handle with exactly 1/2 sheet of So Saffron 12x12 c/s. It took finaglin' though!! Just in front of Darla is the sweet little purse. This purse die was available to demonstrators for preorder in the month of March, and is available to all customers using the Summer Smooches special starting tomorrow ... for the entire month of April. I used Pool Party c/s for the purse, and fastened it together with Tombow glue. I decided that the sticky strip was a tad too wide for the narrow side flaps, and Snail wasn't going to cut it. I didn't have to hold the pieces together ... I think I found another "go-to" adhesive! I found that 4 Hershey's Miniatures fit perfectly in this little purse. I'm going to use a velcro dot to fasten the front though -- it's easier than mangling the scallop topper. 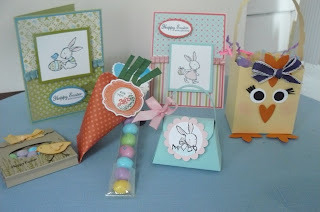 To the left of the little purse is a Carrot Sour Cream container that I first found on Pinterest. If you haven't been to that site yet, be prepared so spend hours being amazed at the creativity that exists out there! I used a 4"x5" piece of Tangerine Tango DSP from the Brights DSP stack and followed directions that I found on Splitcoast. I used my crimper for the "greens" -- next time I'll add a few more to the top! The final accent was a cute little tag from the Apothecary Art set that I colored with my markers ... not the whole thing, mind you ... I discovered that coloring the inside portion, punching it out with my 1" punch, and popping it up on the rest of the tag worked just fine! I used my Framelets to cut out the tag. Cute (and it's filled with Hershey's Kisses!!)! My long cello bag is also so cute! I tried several different fillers ... finally settling on the Peanut M&M's. If there's an allergy, I think the pretzel M&M's would also work. All I know is that the chocolate eggs were too big! Last but not least is my little matchbook favor treat. 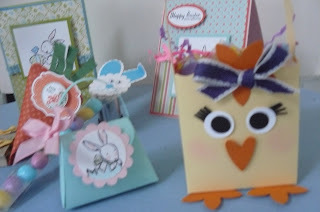 I found this idea on YouTube -- Michelle Last did a great tutorial on the matchbook as well as the "makin's" of the little chick. I think I need to watch it one more time because my little chick looks like he's (BIG TIME!) on the run!! I had the Daffodil Delight 3/8" taffeta ribbon, but missed that there was also a So Saffron taffeta ribbon! The more yellow, the better I say!! There's a better photo of the cards -- I used small pieces of the Everyday Enchantment SAB DSP pack, matted them on complimentary colors, and adhered them to still another complimentary base card. The ribbon is an old favorite of mine -- I just love the Pleated Satin ribbon in ALL of the colors. It was hard to decide which to use this time! I think you can see the cello bag topper better in this photo above. I'm giving my classmembers choice of color for the bunny to compliment their M&M's. Look at that! Darla Duck is looking for the spotlight again! She's so darn proud of her fancy long eyelashes! Don't you just love the blush on her cheeks?! Ready for a night on the town! Does she look like she's headed for an overnight shift at the hospital tonight??!! No ... just me ... I hardly remember to put any makeup on at all for my overnight shifts!! 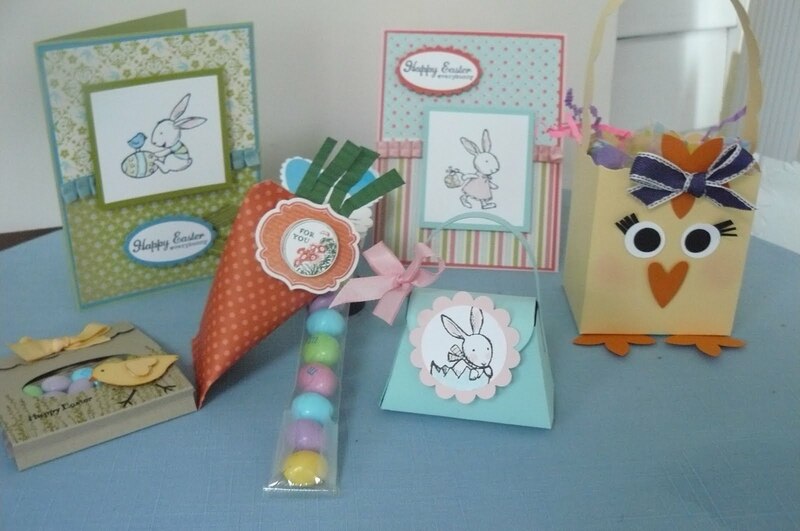 Tuesday "Everybunny" Card Class Preview! Tomorrow evening is my Everybunny stamp class. 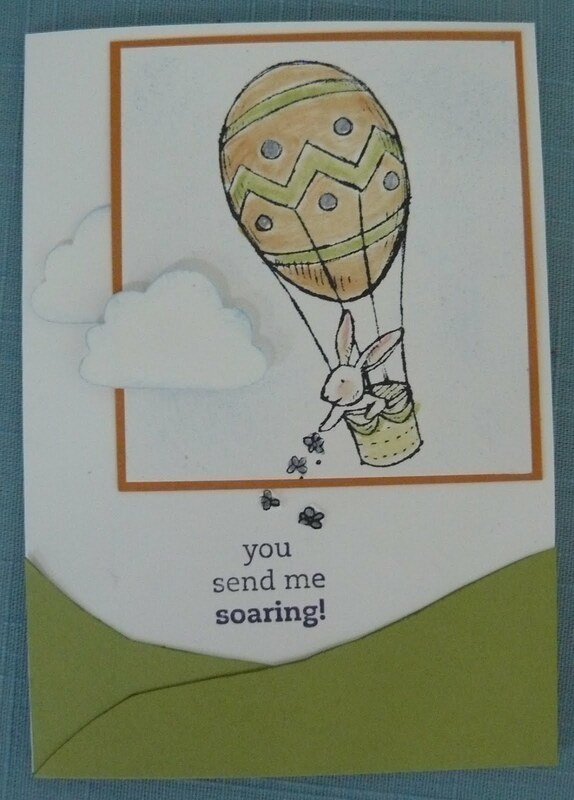 I'm so excited about this stamp set because I immediately saw other possibilities besides the obvious Easter cards that it suggested. 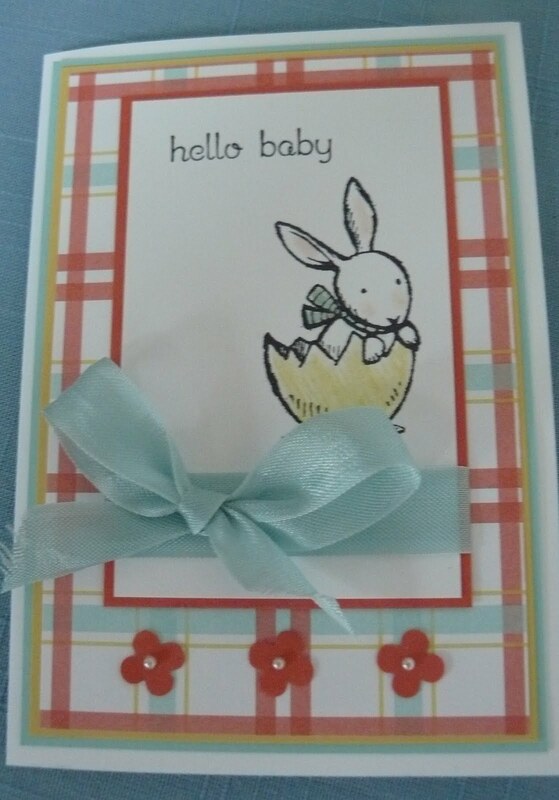 Most obvious to me was the chance to make a "baby" card. Here's the whole group of them together but I'll show you individual photos as well. Group Photo of the Card class for Tuesday night. 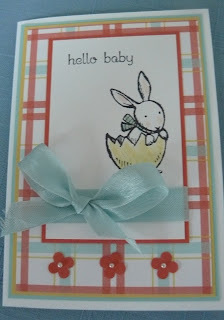 This card was inspired by Lisa Foster and the U Stamp Big Shot class. I originally case'd her card but she called for the note cards that SU sells -- I wanted to make a bigger card for this one. I embossed the Blushing Bride layer, accented with the scallop border punch at the bottom of my So Saffron mat, and tied a cute little So Saffron taffeta ribbon bow. I colored my image with a variety of watercolor pencils, blender pens and ink pads, and watercolor wonder crayons. 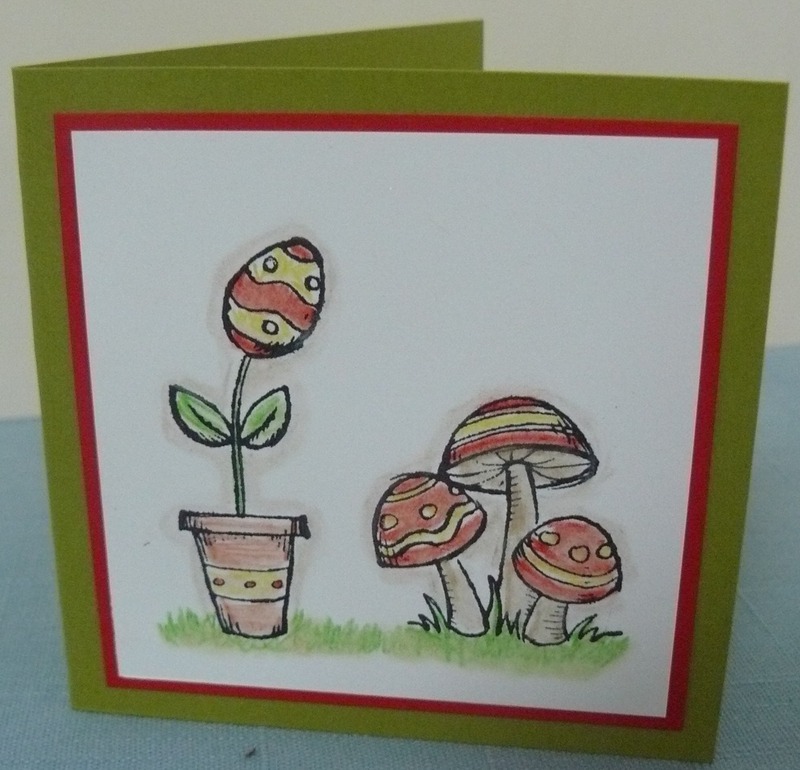 This card was adapted from a sample made by Sandi MacIver. I changed it up only a little bit. Instead of the Lucky Limeade curly edge ribbon that she used, I shose to bring out some yellow -- my favorite color! I used the Daffodil Delight seam binding that customers will be able to buy starting April 1st. I also used the Berry Blossom paper but accented around the paper with the Boho Blossom punch flowers that looked like little daffodils to me. The frame was cut out with the oval die and then embossed with the Textured Impressions Designer Frames oval frame -- don't forget that this is one of the items you can get for free from Sale-a-bration (*which ends on Saturday!!). This is a little 3x3 card. My challenge to myself for this class was to use every single stamp from this 8 piece set. I just love Poppy Parade and thought it would be extremely bright and cheery with the Lucky Limeade color. This card could be a gift card, little note card, or anything you wanted it to be! How fun! This is another card adapted from a card by Lisa Foster and the UStamp Big Shot class I participated in. 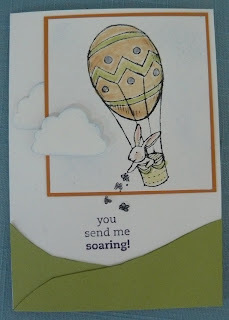 I decided to use the Soaring stamp set for my sentiment. Don't worry -- it's my photography skills, not my stamping, that's not straight!! Did you know that the Cupcake Builder Punch makes adorable clouds??!! 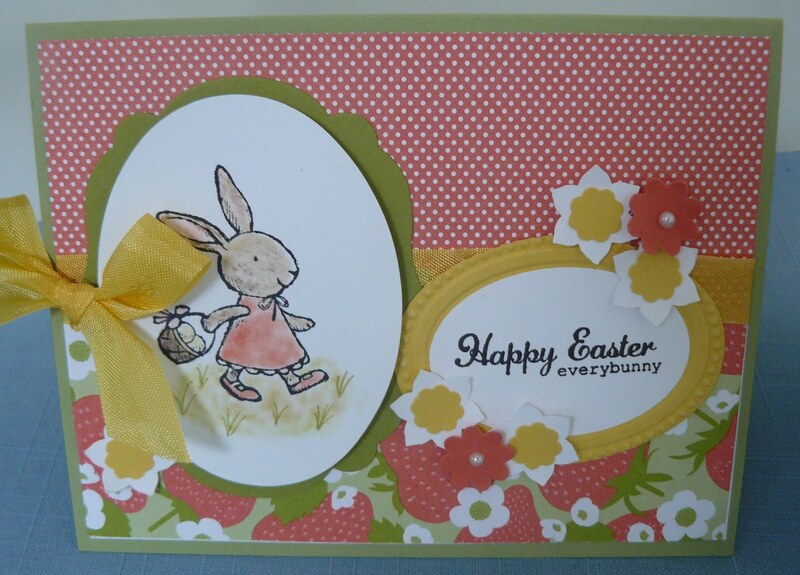 This is a card adapted from a sample by Vicki Burdick. I just love being a demonstrator. 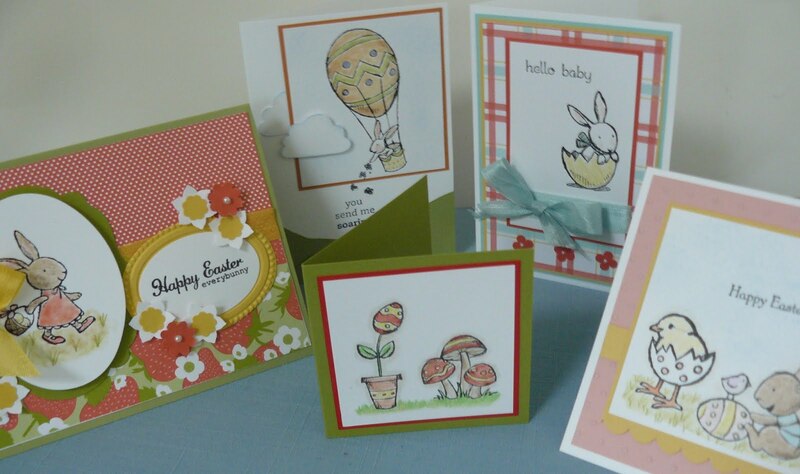 Do you know that I have access to thousands of samples every day submitted by other talented Stampin' Up! demonstrators??!! It's true! 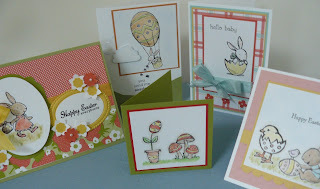 Stampin' Connection is a resource available only to Stampin' Up! demonstrators! I saw a card on the site and decided to make a similar one -- this is note-card size as well. The tiny flowers at the bottom are accented with pearls. The paper is from the Domestic Goddess paper pack. Fun patterns in that pack!! Well, that's all for today, but now you see how much fun my class will be tomorrow night! It's a lot of coloring but we'll have such a relaxing time doing it! I've picked out some lovely music to accompany the class!! Don't forget to take advantage of Sale-a-bration before the end of the week! It's too good to miss out on! If you've been thinking about becoming a demonstrator, this is also the time to think about that -- it's cheaper than usual and there is the option of a free paper pack or free MDS download monthly from now until the end of the year! I had heard that one of the downloads is Stampin' Express! That's huge!! Well, today is my son, Christopher's birthday (14 today, woohoo!!) so I don't anticipate getting a post up tomorrow. Happy St. Patrick's Day to all of my Irish and "Irish" followers!! Here's my "green" card which I'm going to submit to Donna Centamore's (Butternut Sage) Morning Chat Challenge. I've visited the chat once or twice, always with only a moment to go (since it's 10 a.m. - 11 a.m. EST and I ALWAYS remember 5 minutes after the chat is scheduled to "off air"!! The "chatters" are all lovely people! I want to give a special shout-out to Donna -- I went to her house for an absolutely fabulous lunch and escape time yesterday! She prepared a delicious lunch for us, opened up her lovely home to myself and two other Stampin' Up Demonstrators from the area (I say th at, but I need to tell you that one of the girls traveled farther than me to reach Donna's house -- she lives in Litchfield, NH -- probably another 20-30 minutes non-Boston traffic time!!). Anyway, we each shared a shoebox swap (you get to see my finished product next post) and we laughed and shared all of our demonstrator cares away!! It was quite simple really -- 6 hearts punched out from Wild Wasabi DSP from the Subtles stack -- folded in half. I chose a spot near the top for my top clover leaf and set two folded hearts next to eachother. I adhered one heart to the paper, then butted the 2nd half-heart next to it, but then flipped it over to add the adhesive. This step is pretty important. Check your "butting", and then don't forget to flip so you don't add the adhesive to the wrong side of the heart! I didn't adhere the middle of the hearts together -- I wanted them to be 3D and free-standing/flipping. 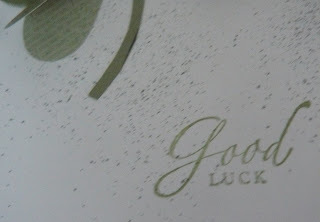 Oops, before the hearts are adhered, use your color spritzer and the Wild Wasabi marker to spritz the front of your card. The bottom sentiment is from Sincere Salutations and the stem is hand-cut from a scrap of Wild Wasabi c/s. The center of the card is one of the new extra large, extra scrumptious Big Pearls. 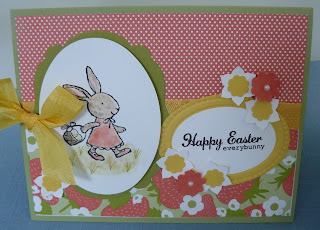 Before you think I'm brilliant, I want to let you know that I got the tutorial for this lovely card from Frenchie! Check her video on the link if any of this is "clear as mud"! I wanted to be able to write in the inside of my card, so my white c/s is cut 8" x 5 1/4", and then scored in half at 4 inches, matted on a 4 1/4" x 5 1/2" Wild Wasabi back. This is my "lunchbox" favorite for my kids for today -- I love to add a special treat related to the holidays! The peppermint patty is sandwiched with a Got Treats clover -- I separated all of my sentiments from my images so I could add the sentiment if and when and where I wanted. I keep all of the background rubber of my stamp sets in the clear just so that I have a special spot to replace my stamps without any of the tiny pieces disappearing without my knowledge! The adorable little guy on the right is from the Gift Givers stamp set -- isn't he just the cutest?! 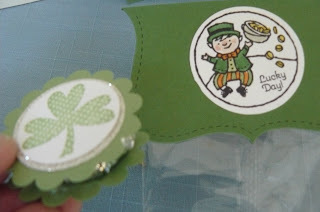 I cut a Garden Green top note with my Big Shot, then stamped my leprachaun dude on a scrap of white, colored him with our fabulous Stampin' Up! markers, and punched him out with the 1 3/4" round punch. The treats had to be green too but I don't think you can see them -- 3 Hershey's Kisses and 2 Andes' mints, packaged in a small cello bag. That's all for today! Have a wonderful day and thanks for stopping by!! 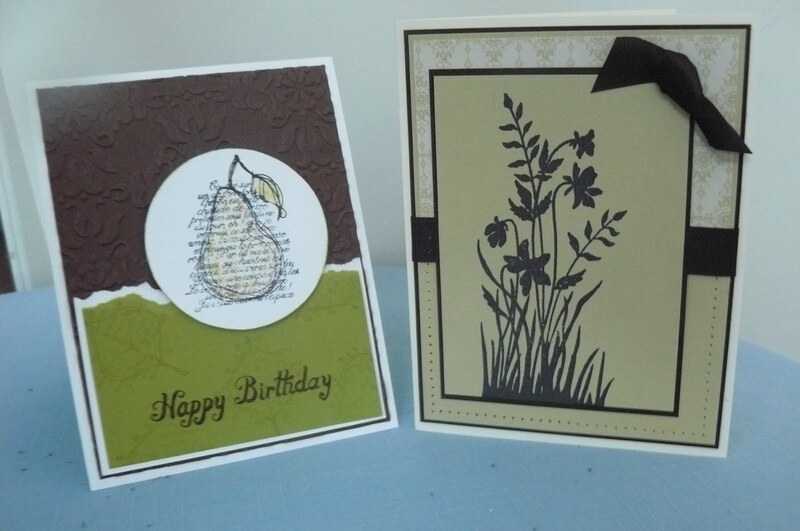 My stampin' students have requested masculine cards -- cards to give for birthdays, anniversaries ... even Father's Day! I made a stamp-a-stack class out of the two styles of cards -- 4 cards each. The card on the left uses the Faith in Nature hostess stamp set. 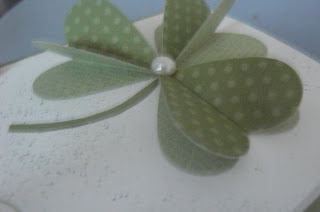 We embossed the Chocolate Chip layer using the Big Shot and the Vintage Wallpaper embossing folder. I think the "Happy Birthday" is from the Bring on the Cake stamp set. That's all for today! Thanks for visiting! 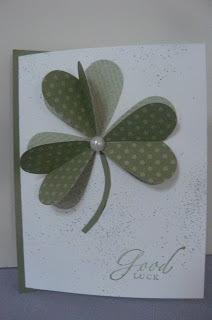 I'm busy preparing for my St. Patrick's Day card class now!